Hot on the heels of their recent Triple J Unearthed slot at Fremantle’s Falls Festival, rising stars Rag n’ Bone are thrilled to announce their latest single Pissy Flow, taken from their forthcoming debut album A Handful of Ash, due out Friday 3rd March. Produced by recording genius Dave Parkin (Jebediah, Tired Lion) at Blackbird Studios, the album includes previous singles and RTRFM favourites I Don’t Feel At Home In This World Anymore, which was added to spot rotation on Triple J, and Last Kind Words. The album sees the band draw influences from the likes of The Birthday Party, Savages, PJ Harvey, and Midnight Oil, and promises to pack all the punch of the Perth rockers’ previous offerings. Rag n’ Bone have graced international festival stages at ‘Rock A La Buse’ (Reunion Island), Music Matters Live (Singapore) and Concrete & Grass (China), along with hometown performances at Falls Festival, State of The Art, Hyperfest and the WAM Festival Block Party. Following the band's four WAM Award nominations in November 2016, lead vocalist Kiera Owen recently won the Best Live Voice award at the WA branch of the National Live Music Awards. 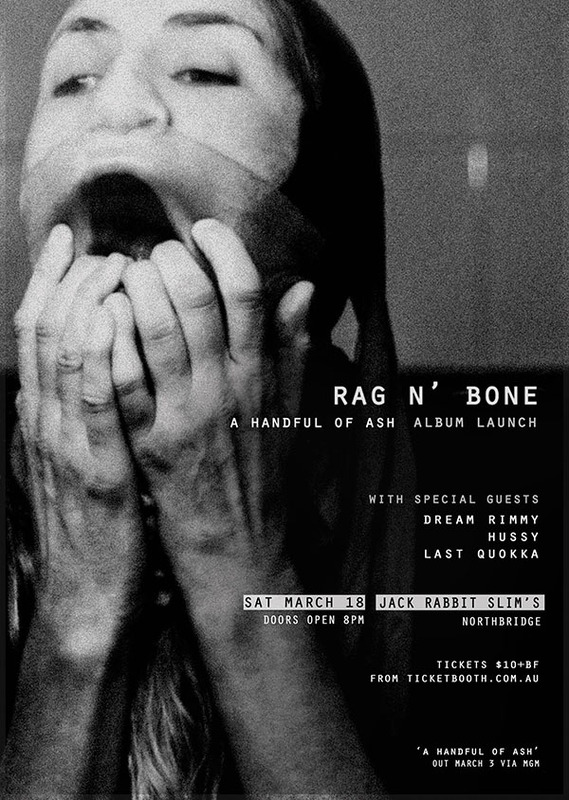 A Handful of Ash will be launched at Jack Rabbit Slim’s in Perth on Saturday 18th March, with Australian tour dates to be announced soon.